Album Cover Art - Featured monthly album. What's New? 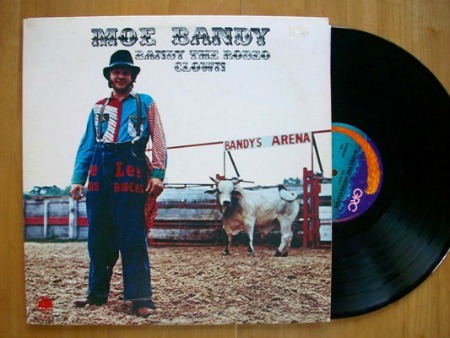 Bandy The Rodeo Clown. Album Cover Art - Featured Album. 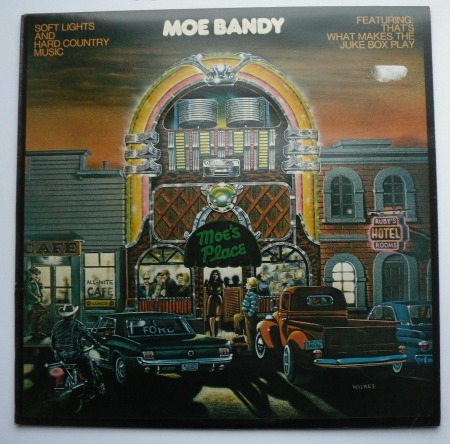 With Moe Bandy featured this month I decided to lead off this monthly addition with my favorite Moe Bandy Cover Art (Soft Lights And Hard Country Music) with illustration by Gene Wilkes. I will be featuring different albums each month to give you an idea why there are some vinyl record collectors (like me) who enjoy the art work as much as the music. Album Cover Art plays a big part in my vinyl record world. There are albums that contain little or no cover art and sell for hundreds or even thousands of dollars. I enjoy the art work and have purchased albums without first listening to the record inside. Displaying album covers as art on your walls can make for a wonderful wall display that reflects your style. It's something unique and creative that is a great ice-breaker, starting conversations about music, art, and all things retro. 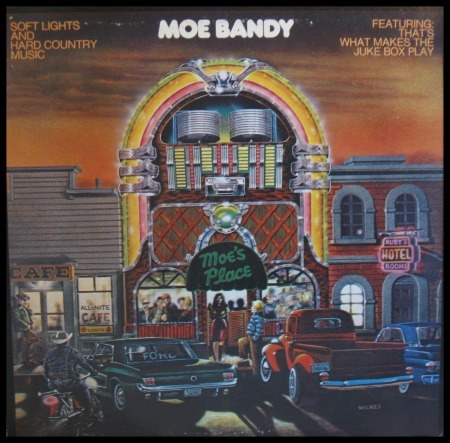 Album art is great for Retro or family rooms and the album above would hang nicely in your "Man Cave." 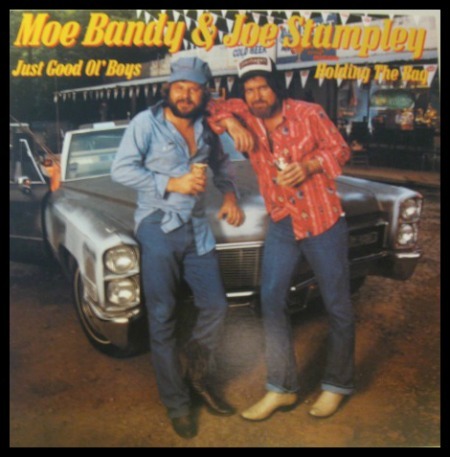 Another great "Man Cave" album art is the Moe Bandy & Joe Stampley #1 album, "Just Good Ol' Boys" from 1979. 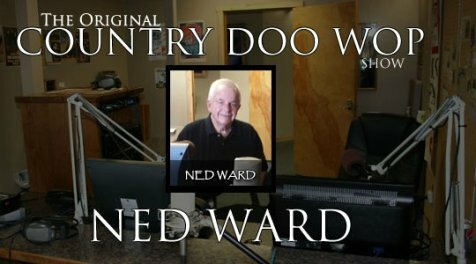 Both albums shown below would be a great addition on the wall behind the bar of your favorite honky tonk entertainment area. Click each album to enlarge. As I wiped the cobwebs from my memory and thought back on the first year I became a teenager, nostalgia overwhelmed me. 1957 was a favorite year for me. I made the leap to Junior high school, turned 13 that year, and met my first girlfriend. Looking back I guess Pat. R. was my first love. Whether she sees it that way, well who knows. 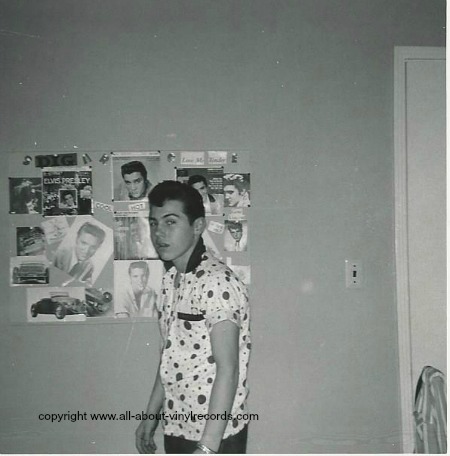 Looking at the bedroom wall you can see why I wrote a page with the subtitle "Growing up with Elvis." What does a 13 year old remember about 1957? I remember the first Elvis Presley movies, all the new TV programs I watched, those cool '57 cars, drive-in movies, and all the new teen idols and singers that came along in 1957. I remember great parents, two wonderful sisters and honest, hard working and friendly neighbors that lived on our block in 1957. But most of all I remember the friends I grew up with in 1957. Friends I remain in contact with 60 years later. Climb aboard this '57 memory train with me and my buddies to a place and time when friends mattered most. A photo journey of what it was like to grow up in 1957 with all these cool happenings around us. My Favorite Elvis Presley Movies. I actually have three Elvis movies that are my favorites, the third being "King Creole" made in 1958. Look at the photo on the wall above and you will see the two 45rpm records shown below. 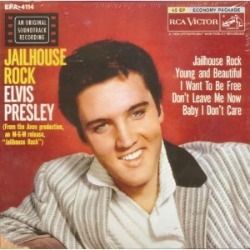 The Jailhouse Rock 45 photo sleeve below was located at an estate sale some years back. It contained the wrong record but I have the original that goes with it. 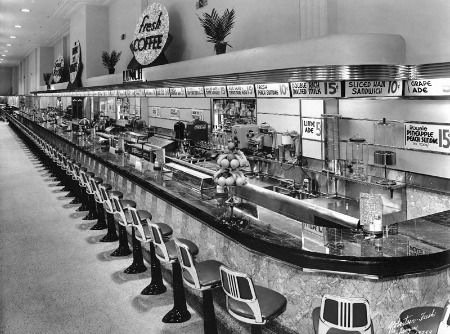 Let's Do Lunch at Woolworth's Five & Dime! Diners like this would be filled at lunch time in many American cities. The diner at the five-and-dime in downtown Hamilton, Ohio was similar to the one above. Eating lunch at the diner was a special treat. The food was good and the prices even better. You could get your choice of a plain or toasted ham or egg salad sandwich, a cheese sandwich or regular ham sandwich for 30 cents. A BLT was 50 cents and baked ham and cheese went for 60 cents. You could add a King size Coke for a dime. Top it off with hits of the day (the ones called oldies today) from Elvis, Ricky Nelson, Pat Boone, The Platters and others playing over the speaker system in the background. I loved those store diners. 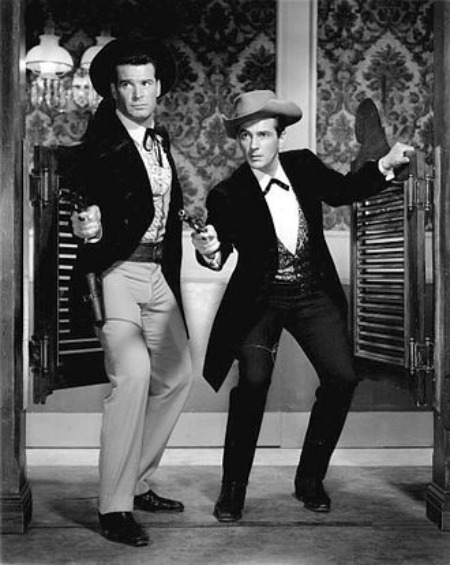 Westerns were big and there was a new sheriff in town beginning in 1957. Everything on TV was family orientated. 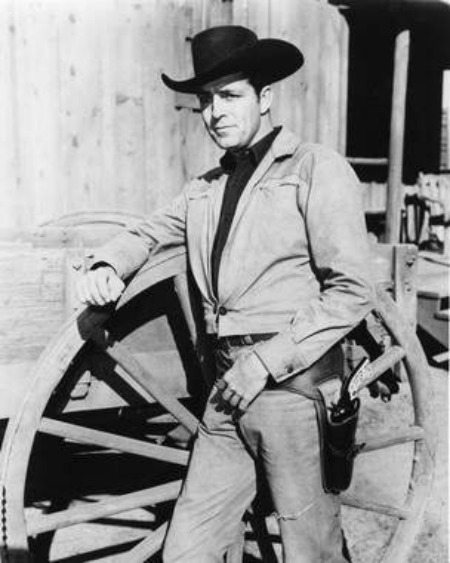 The popular "Leave it to Beaver," "Make Room for Daddy," and "Perry Mason" all arrived in 1957, but I loved the new Westerns. 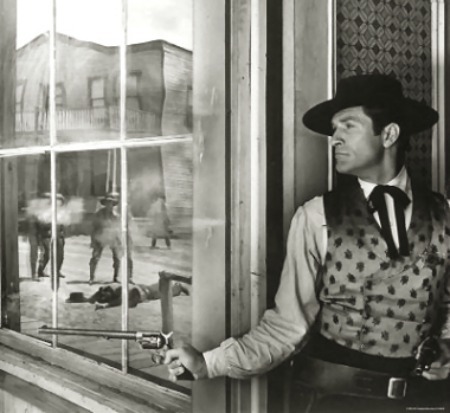 Dale Robertson and Tales of Wells Fargo. 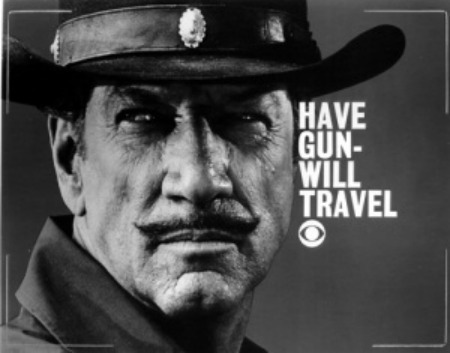 Richard Boone as Paladin in Have-Gun-Will-Travel. The Life and Legend of Sheriff Wyatt Earp - Hugh O'Brien. Popular new TV show Maverick with Bret and Bart. 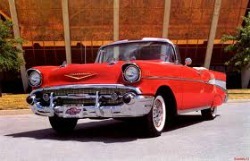 1957 was a major appearance change for most new cars. It was a special time when cars were transported to dealers by truck and also by rail, but at the time, were completely covered from public view. The showroom windows were also papered over. This created excitement for the new cars coming to town and virtually guaranteeing dealerships a showroom full of customers. 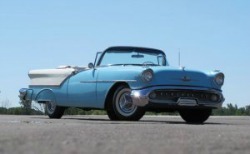 Here are some popular models introduced in 1957. 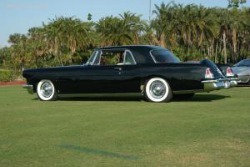 Lincoln Contential Mark II, its last year. 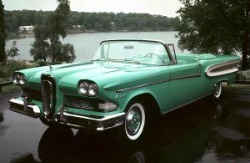 Edsel - It would only last three years. 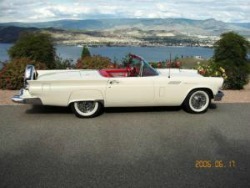 This was the last year for the 2 seater T-bird, sad. 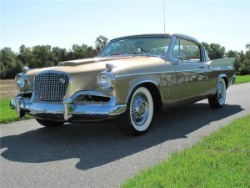 Desoto Adventurer - My neighbor owned one of these. 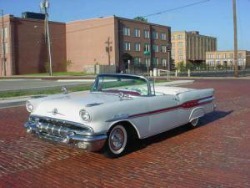 Ford Fairlane made a big change for 1957. I'm a Chevy man but you have to tip your hat to this gorgeous '57 Buick Roadmaster. Now let's get to my favorite part of 1957 - The Music! 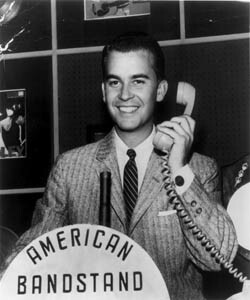 American Bandstand is on the air in August, 1957. First song played “That’ll Be The Day” by Buddy Holly and the Crickets. One song by two different artists would both reach #1 for the first time in History. 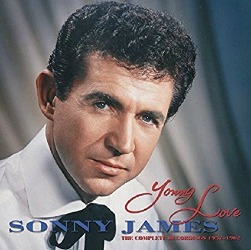 The Song: “Young Love” – Sonny James sang the best version; Tab Hunter's version...not so good. 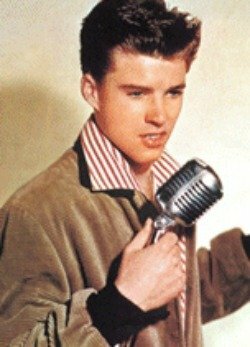 “The Adventurers of Ozzie and Harriet” TV Show would put a 17 year old “Ricky Nelson” up front singing “A Teenagers Romance” and “I’m Walkin”. The show would skyrocket and he would quickly become a Teen Idol. I have the original Verve Record of this recording. It's still in pretty good shape. Some of the new artists I remember from 1957. 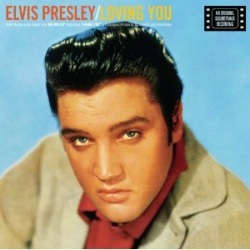 Some songs were released in 1957 but did not become hits until 1958. And some artists had songs released in 1957 and their bigger hit with a different song came the following year. For example, Jackie Wilson released the song "To be Loved" in 1957 but his big hit "Lonely Teardrops" was in 1958. Eddie Cochran's big hit "Summertime Blues" came in 1958 but he recorded "Sittin' in the Balcony" in 1957. There were others - These are the artists I remembered and enjoyed the most. 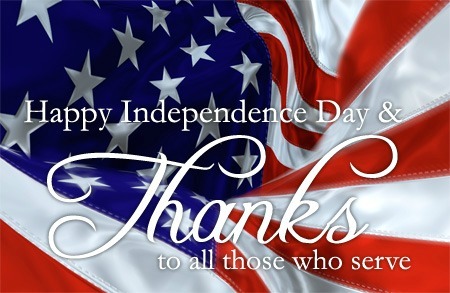 A Special Day for Americans. This is a repeat from the June, 2016 Newsletter as some patriotic songs were put together to show love of country. You can read the articles here. 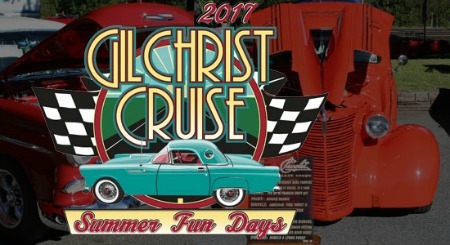 My friend and DJ, Ned Ward, has announced the Gilchrist "Summer Fun Day" will take place this year on July 15, 2017 from Gilchrist, Oregon. 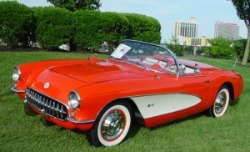 Beautiful Classic cars, a street dance, BBQ, and fun for all, begins with a Pancake Breakfast from 7 to 10am. Click on the photo below for complete details. Are you saying vinyl is dead? "This is absolutely ridiculous. And awesome." "Are you saying vinyl is dead"? "Was this located in a funeral home"? "I'm just amazed there aren't any comments about speaker placement. Killer setup." Some vinyl record junkies go all out to make a statement about their vinyl record collection. 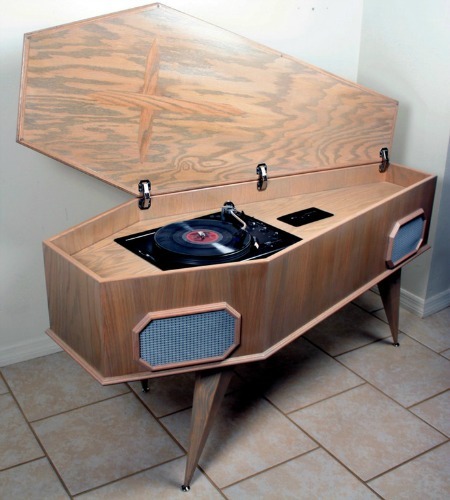 Don't know the thinking behind this coffin turntable setup but it is unique. On the horizon. A Michigan 27 year tradition. The 27th Annual Del Shannon Car Show will take place in West Michigan on August 11th and 12th, 2017.